There were several furriers in business formerly. They were highly skilled craftspeople who had spent years fashioning fur coats and other garments. This page is a tribute to their work, as part of the "Wear Our Heritage" series of webpages. 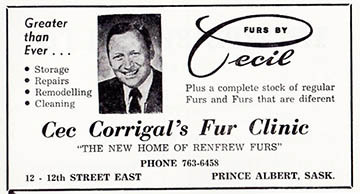 The late Cec Corrigal had a fur salon at 12 -12th St. E. in Prince Albert, Saskatchewan. The ad at the right appeared in an old issue of the Prince Albert newspaper that is available online. This suggests the store was previously called Renfrew Furs. The fur coat in the photo at the right was designed by Cec Carrigal. 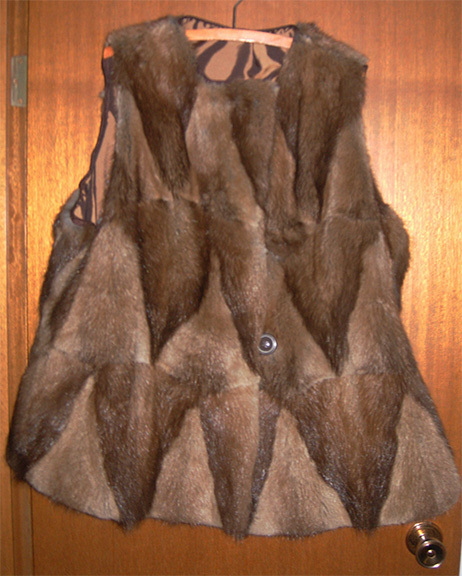 It is a very intricate chevron design of two shades of muskrat on the body, with a fox collar and skirting. It was an extra small or girl's size. I restyled it into an adult woman's vest. The collar and fur border were removed. The sleeves were removed and used to add to the width of the garment, with under arm insets. New lining was made and hand sewn in place. Folk's Finer Furs was located in Saskatoon. 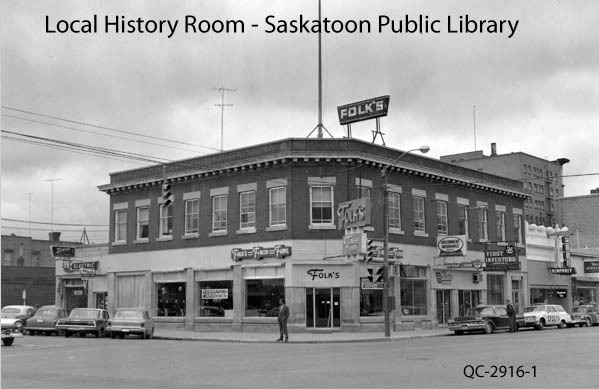 The photo at the right is available online but from the Saskatoon Public Library's collection in the Local History Room upstairs. It was a family business that opened in 1952. Grant Furs Ltd was located at 742 2nd Ave. in Saskatoon and then later at 242 3rd Ave. South. George Grant moved to Saskatoon in 1966, after living previously in Regina and Winnipeg. He immigrated to Canada from Hungary. The fur store was also called Fashion Furs at one time. He died on February 6, 2012. "Once upon a time" there were Eaton's stores across Canada and an Eaton's catalog was a staple in every household. The fur coat at the left bears an Eaton's label. This only means that the coat was made for Eaton's but it does not reveal which furrier made it. The Eaton stores closed in 1999, but the first store was opened by Timothy Eaton in 1869 in Toronto. It is mouton, which was very common at one time. Mouton is sheepskin, usually dyed dark brown, but sometimes black. It was designed to resemble beaver. Steen and Wright was located at 145-147 3rd Avenue North in Saskatoon according to material in the Saskatoon Pubic History Room. The dates of operation are not known at this time, but certainly already in the 1940s. 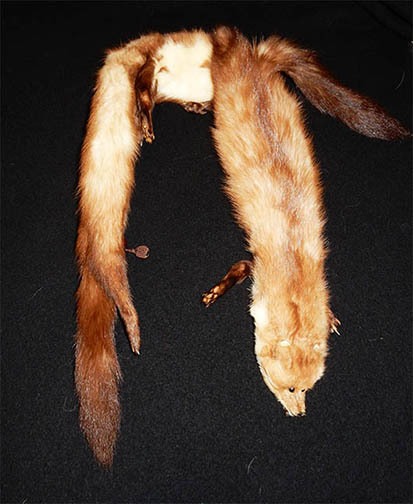 The natural colored mink coat at the right was custom made by Steen & Wright in 1971. I suspect it is farmed mink, not wild mink. There was a Saks Fur Store in Saskatoon and Swift Current. The label in the fur coat at the left has both locations so it's not possible to determine which furrier made or sold it. According to photographs from the Star Phoenix in the Saskatchewan Archives the Saskatoon store was in operation in 1980. Baker's Fine Furs was located in North Battleford at 9800 Territorial Dr. Suite 8. The fur coat at the right was custom made there in 1966, based on the label in the breast pocket. 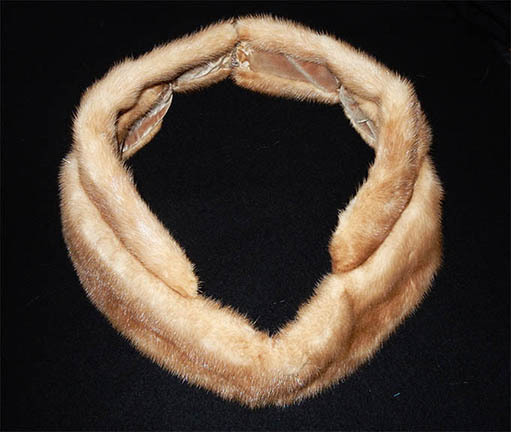 The collar is mink. The body of the coat is probably mouton (sheared lamb/sheep). It has been dyed a dark brown, which is apparently typical for mouton. Western Furs Inc was located at 1759 Hamilton St. in Regina, SK. It shut a few years ago. I have not found specific information about it yet. Reiss Furs was located at 275 McDermot Avenue in Winnipeg. It closed in 2009 when their main furrier retired. They made fur coats and also cloth coats trimmed in fur, such as the Linda Lundstrom "parka" style coats. 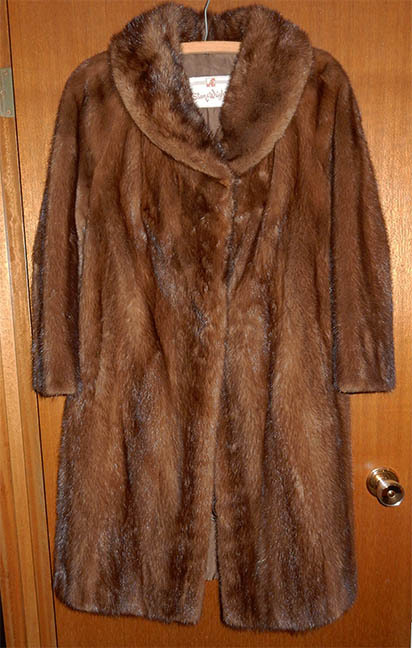 From the 1940s through 1970s, fur pieces were very popular. They were worn by women with suits, in warmer climates, or at warmer times of year. The martin fur piece at the right was made for my grandmother in Green Bay, Wisconsin in the late 1960s. This was the end of the time that style was in fashion. Complete animals were used in the construction complete with feet and tails and the fur bellies inside. The heads were reconstructed on forms with glass eyes. The mink boa at the right belonged to my mother. 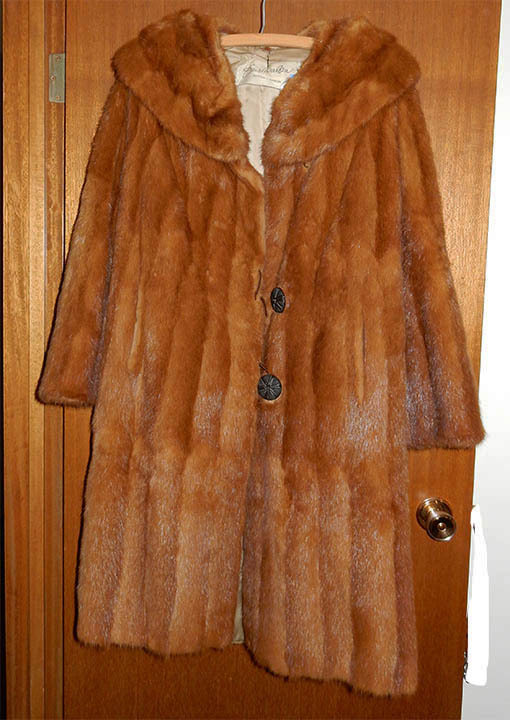 It was made for her by Allen Furs in Stevens Point, Wisconsin in the early 1970s. It was the more "modern" style with fur only, lined in velvet to better stay in place. The raccoon jacket at the right has been relined and the original labels removed. It could be a man's or woman's jacket. It may have originally be longer. It's been "tipped" or lightly dyed I've been told by an expert in Winnipeg. If you decide you want to wear a vintage fur that you inherited, or found in a thrift store, enjoy it! There is also a video on how to clean a vintage fur coat yourself. Lana's Fur and Leather Care Products for Fur Cleaning at home. Her website states that she ships worldwide. 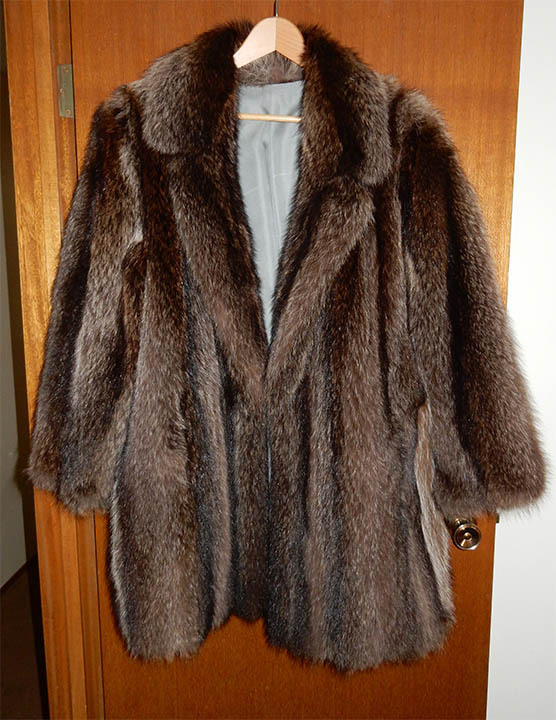 If your fur coat or jacket doesn't fit you and/or you want it restyled, there are several furriers who will take in a fur coat that is in good condition in the spring or summer and have it back to you by the following fall. 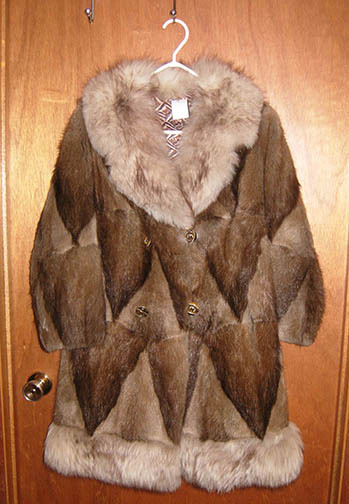 Currently many older furs are sheared and made into reversible coats with water repellent taffeta on one side. There are also stores such as Harricana in Montreal, that specialize in using recylced fur. Although this video "Vintage Furs" from Saga Furs is in Finnish, it gives you many ideas on how you might want to restyle a fur coat, or have it restyled. Shortening a long coat to a jacket or car coat length is quite simple. More major restyling can be more challenging, and is probably best left to an experienced furrier. If you decide you'd like to try to remake an old fur coat, there are some webpages that provide some instructions or tips - either to try yourself or to use when working with a furrier. A 2009 post from the Sewing Divas provides details and many illustrations of the restyling process. YouTube Fur Coat into Fur Jacket by Gabby This is likely a muskrat jacket with a raccoon collar. A HREF="https://fashionmagazine.com/fashion/fur-restyling/"> How I transformed a family heirloom and made an old fur coat cool again by Karen Cleveland (Nov 13, 2015) She took the coat she inherited and had it restyled at a Toronto furrier. Used Furs: Making Cozy Winterwear Without the High Cost by Suzanna S. MacDonalad. Mother Earth News, January/February 1971. Some tips on purchasing vintage coats that have a higher chance of restyling. Making an Old Coat New from the Washington Post, October 1, 2008. Brief descriptions of some techniques professional furriers might use in the restyling process. Sometimes a man wants to wear fur and more power to him! 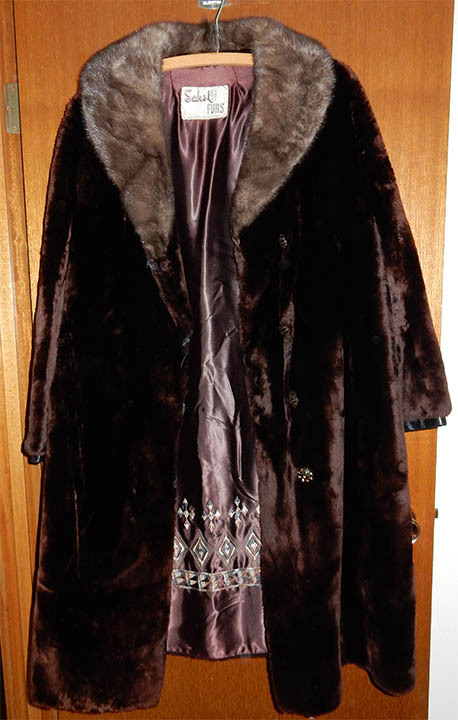 This is a wonderful article on how to make a vintage fur coat, worn by his grandmother, into a large fur scarf and how to wear it. 1 Piece/3 Ways: The Genuine Fur Scarf by Dan Trepanier in the series "Articles of Style", January 19. 2012. The Indefinite Article 249 A 2nd Ave. S, Saskatoon. 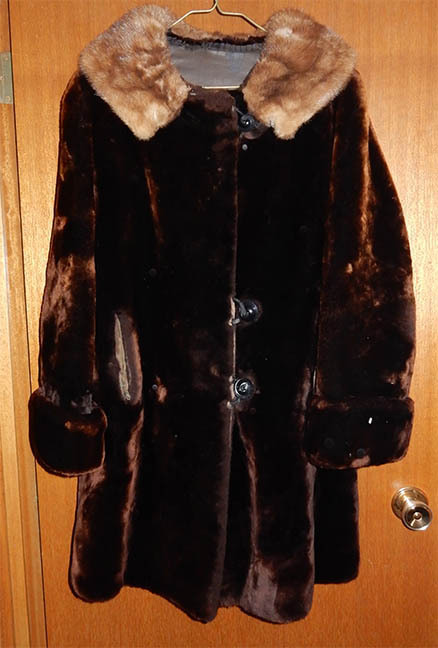 Vintage fur coats and jackets in good condition. Marion knows her furs too! Open Thursday through Saturday. Better Off Duds. 510A 33rd St. West, Saskatoon. Wide selection of fur coats. Goldies General Store. Above the Hollows Restaurant, on 334 Ave. C South, Saskatoon. Open 11-3 Sundays only. Many vintage fur coats.